So, I am still here...I promise! The holidays and new year bought a number of activities along with some changes. I am happy to be back and promise to post more frequently. So, I got a new sewing machine for Christmas that actually has feeder dogs. My old one did not and it made life tough in that area. I have been sewing a lot more since I got the machine and want to share two of my creations. 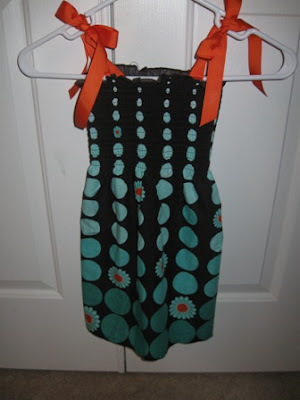 The first is a shirred dress. I cheated with the fabric that was bought ready made. I simply added the seam and ribbon for the straps. Kayden looks super cute in it and I cannot wait to make a few hairbows to match. 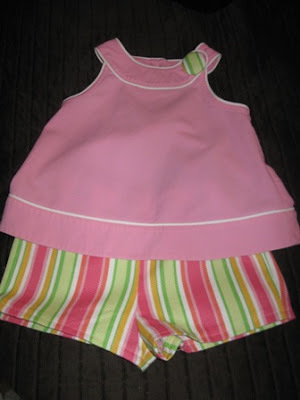 The second creation is a pair of shorts. A friend of mine gave me a box of 3T summer items and the pink pique shirt was included. I found the striped pique fabric and decided to make some shorts to complete the ensemble. I then covered a 1 inch button with the fabric from the shorts and replaced the one that was originally on the shirt. I was so pleased with how they turned out. Looking at the state of our economy, I will be sewing a lot more. The dress costs me $7 to make and the shorts were less than $3. Talk about saving money! I love this and I love the colors!